Minnie Mouse’s fashionista style is not only cute and classic, but it’s making an impact on the transportation world! 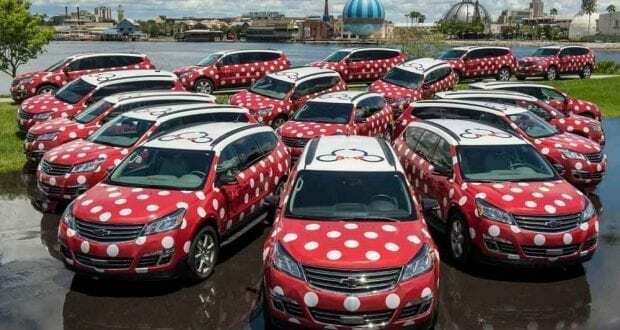 That’s right… Walt Disney World’s roadways are filling with red cars with white polka dots and rocking the name “Minnie Vans”. This isn’t your typical pile everyone in the car for soccer practice type of minivan, but rather, stylish wheels that offer a relaxing ride to and from destinations all over Disney World property. Roll with us through these six things you’ll want to know about the Minnie Van service before rockin’ the dots through town! 1 – What Is This New Transportation All About? Disney World has all sorts of transportation options including bus, boat, the Monorail, and walking paths. While all of these options are extremely useful and complimentary to guests, Disney was seeing an influx in Uber and taxi use among their guests. Disney responded to this trend by partnering with Lyft (an on-demand transportation company) to launch the Minnie Van Service. The service began as a pilot program in July 2017 at just a few select Disney World Resorts. When these red with white polka dot Chevrolet Traverse SUVs began hitting the roads, popularity grew! 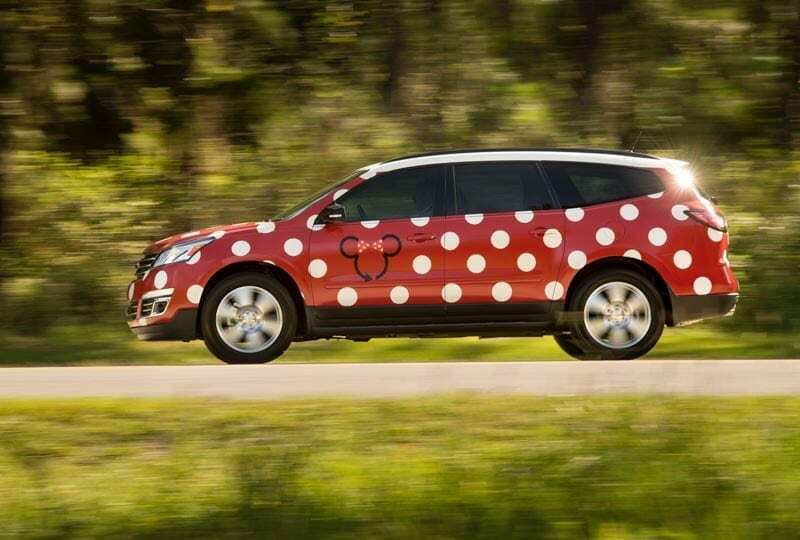 Minnie Van Service is now available at all Disney World Resort hotels. The Minnie Van fleet is comprised of many Chevrolet Traverse SUV allows for up to six passengers. Two wheelchair accessible vans are available as well. An infant car seat and toddler car seat are readily available in each car if you have a little one you need to haul. Drivers will put the car seat in for you and you simply buckle your little one in. We also like that the drivers are actual Disney Cast Members (many former bus drivers). The hours of operation are 6:30 am to 12:30 am but we hope this time frame will change as popularity grows. For example, we’d love for it to be available early enough to drop us off at RunDisney events when we are ready at 4 am or late enough to pick us up when we’re done dancing the night away at the Atlantic Dance Hall at 2 am. To use the service the first step is to download the Lyft App if you don’t already have it on your phone. The Minnie Van service is organized via the Lyft App… not the My Disney Experience App as you’d suspect. Once that is done, Lyft will offer easy steps to send for a driver, driver’s current location, and how to input your credit card information. Simply confirm your location, tap your desired destination and then watch your Minnie Van’s progress on it’s way to pick you up. 4 – Where Can You Go? The Minnie Van Service will take you all over Walt Disney World property. It can pick you up or drop you off anywhere on property. Disney Resorts, Disney Springs, ESPN Wide World of Sports, all four theme parks, and Disney’s two water parks are all included in where you can go! We’ve learned the Minnie Van service is especially wonderful when going to and from Magic Kingdom. Unlike Uber or a taxi, the Minnie Van is allowed to pull in where the buses pick and drop off right at the entrance of the park. If you take Uber or a taxi to Magic Kingdom, you’ll be dropped off and picked up at the Transportation Ticket Center. Guests can now use Minnie Van for rides to and from Orlando International Airport from most Disney World resorts. 5 – What Is The Cost? Unlike all other forms of Disney World transportation, Minnie Van service is NOT complimentary. As of September 2018, the service now has a flat fee of $15, plus charges $2.75 per mile. Most trips will now be around $30. This was disappointing news since before it was a flat fee of $25. Now a trip from the Contemporary Resort to Disney’s Animal Kingdom will cost almost $40! We mentioned the recent addition of Orlando International Airport drop off and pick up availability above. The cost for that specific Minnie Van service is $150. Keep in mind, the Magical Express will do this for resort guests at no charge. Lastly, your app will state that no tip is required as typically Cast Members are not tipped for their services. When we asked our driver about the tip process, he stated it’s not required or expected but if a guest would like to leave a tip they are welcome to. Overall, our experience with the Minnie Van Service was an exceptional one. We used our push notification from the My Disney Experience App as our invitation and downloaded the Lyft app. We were at Magic Kingdom on our last day of our week-long trip. We were tired and there was the usual mad rush out of the park after the fireworks. We decided while the crowd rushed out, we’d have a seat and send for a Minnie Van back to our resort. The Lyft app is extremely easy to navigate through and within a minute, we had Minnie Van number 28 ready to serve the our party of five. We got a call immediately from the driver that gave us directions on where he was located in the bus loop (although the app was showing us where the Minnie Van was located too). We walked out of the park directly to the car where the driver greeted us. He was great with helping us get loaded with all our bags, asking if we needed anything, and even opened the doors for us. The drive back to Old Key West Resort where we were staying was a peaceful one. No fighting bus crowds! The driver played some Magic Kingdom music and chatted with us as we drove. We learned he was a former bus driver, but was loving this new role. It was especially comfortable knowing he knew the most direct way through the traffic and construction. He pulled into our parking lot, as close to our room as possible at Old Key West. We had already paid the fee via our credit card on the app, but as mentioned above regarding tips, we gave him a cash tip. Will we use this service again? Absolutely! It was well worth the money in our opinion for when we needed it most.